Maximise your time, whether for work or pleasure, by using private helicopter hire in London, to give you a VIP service, better security and a flexible timetable built around your own bespoke itinerary and travelling requirements. Take advantage of short breaks or more efficient business travelling by using private helicopter hire in London to get you to your destination, when you want to be there. Using private helicopter in London gives you point to point travel so you are able to significantly reduce your travelling times. With private helicopter hire in London you will be picked up near your home or office, which saves you time and gives you greater convenience and flexibility. This frees you from the constraint of scheduled timetables for airlines and trains and the congested roads in and around London, so you are able to attend those extra events or meetings by winning time back from travelling and without the need to keep one eye on the clock. 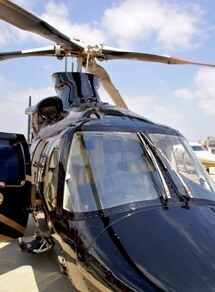 Travel in a fast, efficient and flexible way with your private helicopter hire in London. Even the busiest of people can enjoy their time making the most of invitations out in the country without the need to decline based on travel times. You will also avoid worrying about arriving late for that important meeting or missing the start of that long awaited West End Show, so you can focus on the business ahead or relax and soak up the atmosphere, as using a private helicopter hire in London gives you peace of mind for your travel arrangements. Simply pick up the phone and your travel arrangements will be taken care of, including all those little details which matter to you. Benefit from the reliable private helicopter hire service provided from our offices in London and the south coast of England, designed to give you maximum enjoyment from your trip. With all the details and trivia taken care of you are able to fully experience an enjoyable day out or focus on succeeding with your business trips, reducing the need for overnight accommodation as a bonus. This is a bespoke, personal and discreet service, designed to make your journey more than just a means of travelling. Using private helicopter hire in London is a lifestyle option for the discerning passenger who values their time.